2018 PPD120E new property which is an Desoldering Rework Station tool for iPhone A8 A9 A10 A11 CPU. last year, we always saying PPD120E can work with A8 A9 A10 CPU, No need the hot Air Rework station, but now, it also Support For Iphone X A11 CPU! Some technicians are curious to know how to use PPD120E For Iphone X A11 CPU? 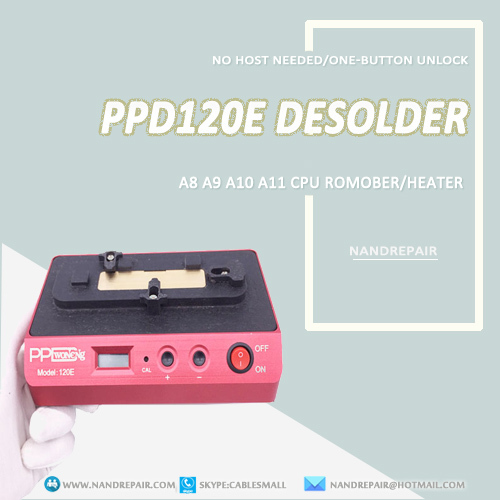 At the same time, we also have a product that is very similar to PPD120E, It's called PPD120X A11 CPU Desoldering Rework Station, PPD120X For separating working on the upper/lower iphone X' motherboards, avoid motherboard damaged, If you want to repair iphone X logic board more faster, just try with PPD120X iphone Preheater, it will not let you are disappointed.